The Universal Joint Couplings we offer are designed using alloy steel with heat treated working parts. 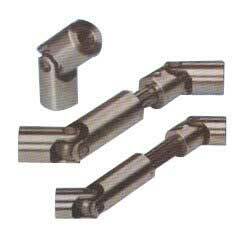 We make available the Universal Joint Couplings with or without finish. Universal Joint Coupling is used in Conveyors, Material Handling Equipments, Car Parking Systems, Cable Machineries and Air Handling Unit. The Universal Joint Couplings are manufactured keeping the market standards is view and are priced reasonably.